I had great fun making this. My three year old daughter Isabelle loved the sheep or 'baa' as she calls him! I decided to make this St.Patrick's Day card as a bit of an alternative to the norm. Ireland is well known for it's green fields and you can often see white sheep dotted across the green. The white and yellow daisies give the card a little extra lift. 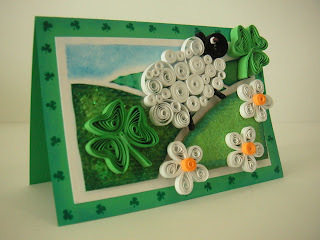 Most of the elements in the card are quilled but the green fields are basic shapes cut out of varying textures and colors of green paper and card. The base card is green, I used a darker green blending chalk to soften the edges of the card, then I stamped little shamrocks all around the edges as a border. I added a smaller rectangle of white card to the centre. I masked the top and sides to create the sky using light blue blending chalk, so there is a narrow white border around the picture. I sketched the field shapes on a piece of paper first then I cut these out and used them as a template to cut out the different textures and colors of green from card and paper. I wanted to create quite a texture look so I used painted paper, crimped card, PVA and painted paper towels for the fields. I added some depth to these by rubbing green ink over the edges and by using blending chalks. I added some flocking powder to the two fields in the front. I glued the field shapes in position leaving a white gap between them, the same as the border. 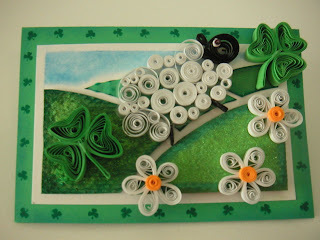 The shamrocks are made using the wider green quilling paper, three simple heart shapes with the stem made from quilling paper folded over on itself several times. 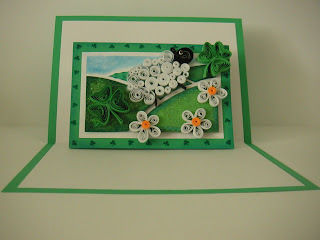 I glued the shamrock together before gluing it to the card so I could play around with the layout. The flowers were simple too, just five quilled petal shapes with a yellow closed coil centre on top. I glued these together before adding to the card as well. The sheep itself is made up of varying sizes of open and closed coils and a few scrolls in white quilling paper. I made up all these first then played around with the shape until it looked right. The head is made up of a large tear drop shape in black with a tiny one for his ear. The eye is a tiny closed coil in white and a tiny black bead on top. The legs are black quilling paper folded and glued back on itself several times. I did glue the entire sheep onto a piece of acetate (I don't normally do this but it was easier so I could reposition him in the layout) and cut it out carefully when it was dry. With all the elements made I played around with the layout until it worked and then I glued them in position. Studio G designer clear stamps, Impress Dye Ink Emerald, Dovecraft Bright Blending chalks, green flocking powder, black bead, glue, quilling paper in green, black, white and yellow, quilling tool, acetate, acrylic paint, PVA, paper towel, crimping tool. Love it!!! So bright, so positive, so lively! Good job! A very nice 'baa'!!! Pezadoodle, I did get your e-mail, I was away so I'm only catching up on my e-mails now! sorry about that. oh this is so cute! I love everything about it. This is so cute, so so cute. 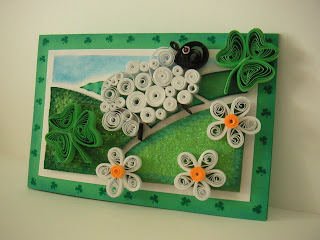 I love looking at quilling from other countries, it's so neat to see the way each of us solves a problem - I never would have done my sheep that way, he is fabulous. I also have started using acetate when I quill larger embellishments, it does make it easier to transfer to a card or other item. Great job on this card! Thanks Tracey, yes using the acetate is handy sometimes, especially if you're working on the layout, much easier to move around!